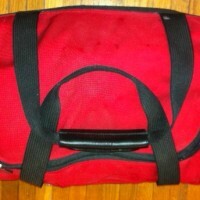 Home » Fitness » Adult Fitness » Packing the Gym Bag to Work- Why it Works! Packing the Gym Bag to Work- Why it Works! It can be challenging to get motivated to hit the gym after a hard day of work. But planning ahead can help you stay on track with your fitness plan. Pack your gym clothes the night before and take them to work with you. This keeps you from wasting time by making an extra trip home, and potentially staying there. If possible change at work at a pre-set time! Set an alarm on your watch or computer. When it goes off, stop working and change into your workout clothes. This might give you that extra motivation to go straight to the gym and not get side tracked with other errands. The work will still be there tomorrow, so get in some time for yourself! Pack a healthy snack and eat 1-2 hours before you leave work –this way you’ll keep your energy up for a good workout, and not cut it short because of hunger. Be sure to choose a healthy whole food snack –like fruit and nuts, 100% whole grain crackers with 2 teaspoons of nut butter, low-fat cheese with fruit, or Greek yogurt. Get in the habit starting today to pack your gym bag the night before –this will quickly become a healthy part of your daily routine. Plus, you’d bear the burden of guilt of an untouched gym bag, staring back at you if you skip the gym on days you know you could really use the workout. Comment on Packing the Gym Bag to Work- Why it Works!